Kensington portable laptop locks are known for their security and durability. 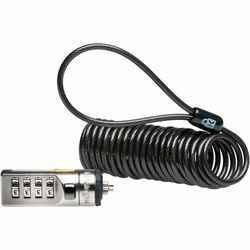 Thoroughly tested for greater security, this lock features the patented Kensington T-bar for superior strength, a tamper-resistant design, combination 4-wheel lock and a self-coiling cable that extends from three inches to six feet. You can choose from 10,000 possible combinations to keep your mind at ease. The portable lock is also compact and lightweight, so you can take it with you anywhere.